Glad you are past the pain of painting - Not a fan of that either. Looks great! Did you paint the artwork or get it printed? Thanks. It's printed. If this was my paint job, it wouldn't look any good. Nice. I to need to get my cabinet ready for painting. Not my favorit part. But seeing the white cabinet, think i will go with white as well. Not sure about the t-molding though. 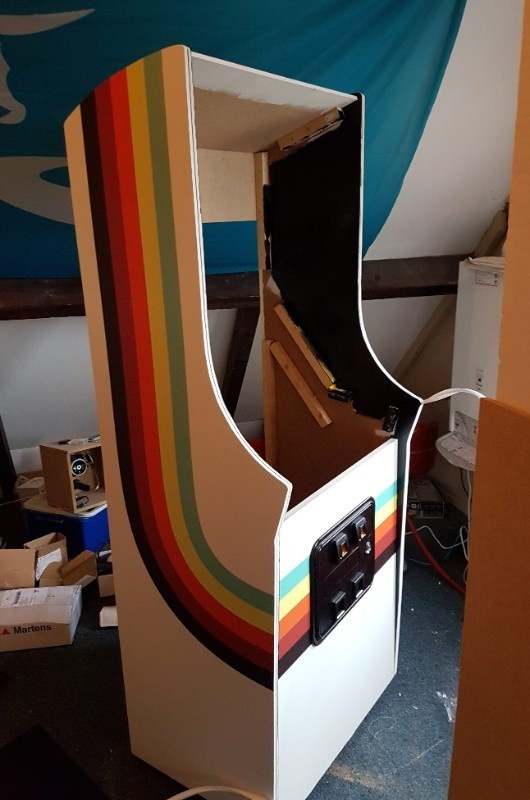 Currently have some white installed, but as the sides aren't exactly white, but more yellowish/offwhite, I am considering black or orange t-molding. I'd go with orange. White looks too bleak, black is too much of a contrast. I like either the black or orange t-molding. Leaning more to orange though. I do agree the white is a bit bleak, but as I want to put the cab in the living room for a while I don't want it to be too outstanding. While I like the orange I think it's a bit too flashy having in your face the whole time. And the problem with the orange is that it will be quite hard to find the right kind of orange. And yes, the black is quite a contrast to the sides, but I still kind of like it. So I guess I will order some longer samples of orange and black and I will try those. Thanks again! Will change the marquee retainers to black, but for the rest I'm quite happy. I will get some T-molding samples from my supplier in orange and black. So will decide on that later. Looking good, Barry. 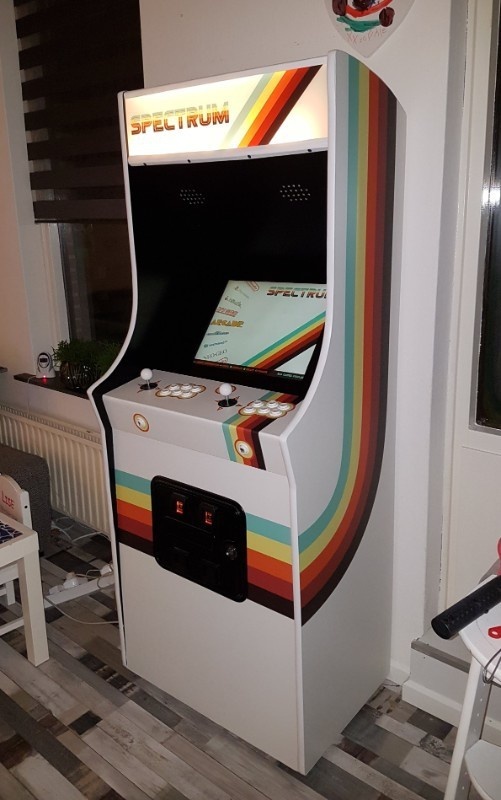 Great example of a retro-inspired cab. Black or white I reckon... the orange overpowers the nice retro stripes, imo, giving them less impact. This cabinet came out superb. Well done! Excellent build! Been working on a couple variations of this type cabinet as well. Since you built the CP out of wood instead of metal, how are you holding it down? can we get a pic of the inside brackets you used? I'd go with black T-molding- it frames the cabinet nicely. The orange will only work if it is in the exact same hue as the color on the print. I like the white molding. Looks classy. Nice job. The colors look great on the cab. I think any one of the stripe colors would be a good choice for T-molding color. The t-molding samples are delivered to the neighbors today, so will check them tonight! But I must agree with yotsuya that I kinda start to like the white as well... We'll see. Most important for now is the marquee retainer... Will be thinking about that this weekend probably. Another vote for white. Graphics came out nice, good work. Amazing work! I like the white too, Orange and black stood out too much. I agree with your colour choices. This thing screams class! That looks really good! Glad to see it come together like that. Well done. Anything but white t-molding will distract from the really nice colour work in your graphics. Go for white. the white flattens it out and the orange pushes toward loud.. Page created in 0.238 seconds with 46 queries.